Till about a decade ago, Rajib De’s house in Kolkata’s Salt Lake City overlooked paddy fields and green open spaces. Things started to change, slowly and perceptibly, in 2010. The fields were transformed into sites for apartment buildings and the open spaces became smaller and smaller. De, photo editor at Sangbad Pratidin, a Bengali daily, started photographing this shifting landscape—the under-construction flyovers, tall buildings, and the new street signs. The area was named, appropriately enough, New Town. “At the time I thought I was capturing an example of thoughtless urbanisation, a new city replacing rural soil,” said De. De revisited his perception of New Town in 2011 after he saw pictures of a friend’s trip to Hampi, the heritage site in Karnataka that was the Vijayanagara Empire’s capital in the 14th century. In the background of the touristy photographs were the remains of a once-thriving city. “The fact that it was a living, breathing city of its time and that in some ways it still is an example of civilisation really struck me. It made me think of New Town as the beginning of a civilisation.” Soon De made his first trip to Hampi to photograph the ruins. A combination of these two projects is currently on display at the India International Centre in Delhi. 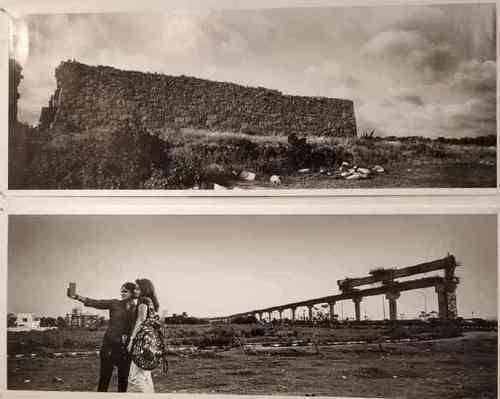 Titled A Tale of Two Cities: A Photographic Study of Urban Memory, the photo exhibition highlights the connection between Hampi, in its crumbling glory, and New Town, with its high-rises and modern architecture. Over the last eight years, De has taken more than 1,500 photographs of the two places, of which around 30 are included in the Delhi show. His black-and-white photographs of Hampi reflect the stark beauty of the UNESCO world heritage site. There are, for instance, caption-less images that show a structure held up with stone pillars that once housed a large bazaar; and the Talarigatta, the toll gate that was the main entrance point to the capital and temples where people would congregate. Hampi and New Town juxtaposed at the exhibition. De had initially wanted to focus solely on the environmental impact of urbanisation. “Natural beauty and resources become secondary in the pursuit of extending cities,” he said. “Bland…buildings are constructed but most of them stand empty, with nobody to occupy them.” In a couple of De’s images, the architecture of the two places is in sharp focus: one shows an elaborately-designed temple, while another shows the signage meant to identify barely distinguishable buildings. The final pair of images in the exhibition ends De’s narrative on a thoughtful note—that of continuity. The photograph of Hampi shows structures in near-pristine condition, while the image of New Town is that of a construction worker carrying on his work even as we get a view of the sprawling new neighbourhood behind him.